This colourful stir-fry dish tastes as good as it looks (from the photo in the book, that is!). The main flavouring comes from Laoganma black bean sauce, a rich oily black bean relish made from fermented black soy beans, chilli oil and other seasonings. I thought that this sauce is delicious! It is not the same as the regular black bean sauce. It has chilli oil and other seasoning, which makes it really tasty. To make this dish, I've used spiced firm tofu, which is sliced to strips. The veggies; celery, red pepper, onion, spring onions are all to be cut to similar size as the tofu. For the Laoganma black bean sauce, I have added an extra tablespoon. Get everything sliced up and all the other ingredients ready before you start with the stir-fry. This dish is a delicious way of cooking tofu, a tasty dish with hot fluffy rice, though I could settle down with a pair of chopsticks and enjoy this dish alone! Members can choose any of these cakes to bake, and my choice is Pineapple Coconut Cakes. In the recipe, the author has used eight small fluted petit-Brioche pans. I do not have any Brioche pans so I've used two small round pans instead, size 5-1/2". I bought those cute little pans from Ikea a couple of months ago and have not used them before. Now is the good time to put those pans to use. This cake was brushed with pineapple syrup, but I have omitted it. I was afraid that it might be too sweet. A slice or two makes a wonderful tea-time treat. Overall review : Very nice cake. Moist and buttery with soft crumbs. I was glad that I have reduced the sugar, as with the reduction in sugar, the sweetness was just right for us. Not too sweet but with a touch of sweetness. The only thing that I would change is to add more chopped pineapple to the batter. Lovely cake to snack on with a mug of warm green tea. 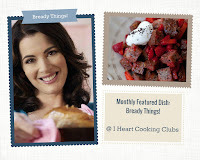 This week' s at I Heart Cooking Clubs (IHCC), we are celebrating all Bready Things! I've made Hugh Fearnley-Whittingstalls, (our current featured chef at IHCC), Wholemeal Drop Scones. These are super easy to make. The drop scones are tender, moist and very tasty. Great with a dollop of salted butter and some honey. We had the drop scones with some sliced bananas which I've cooked for a few minutes until the bananas are softened, with some butter and honey, with a handful of dried cranberries. Yummy! Sift the flour, baking powder and salt into a large mixing bowl and stir in the sugar. Make a well in the centre and break in the eggs. Pour in about half of the milk. Whisk, gently at first, and then as you start to get a thick paste, add more milk and the melted butter. Beat until you get a creamy batter a little thicker than double cream - you might not need all the milk. Put a large, heavy-based frying pan or a flat griddle over a medium-high heat. Add a few drops of oil and rub with a thick wad of kitchen paper to oil the pan very lightly. Pour (or drop) a scant tablespoon of batter into the pan - to get a disc about the size of a digestive biscuit; you should be able to fit 4 or 5 in the pan. After about a minute, little bubbles will start to appear on the surface of the drop scones. As soon as they cover the surface, flip the scones over with a spatula - be warned, the first batch may stick. Cook the other side for 40-60 seconds or so, then transfer the drop scones to a warm plate and cover them with a clean tea towel so that they stay soft - or hand them over to those waiting eagerly to get stuck in. Cook the remaining drop scones in the same way, adjusting the heat level if they start browning too quickly and re-oiling the pan with kitchen paper as necessary. To serve, top with a little butter and sprinkle with some sugar, and a fine dusting of cinnamon, if you like. Or serve buttered and spread with jam, honey or macerated fruit. Eat quickly, while still hot. Monthly Featured Dish : Bready Things!